Wearing a bike helmet when out bicycling is extremely important, and could prevent a serious or fatal head injury after a fall. Sadly, a local teenager was recently injured, who was not wearing a helmet. He was riding his bike on the shoulder of state Route 35. The bicyclist attempted to cross the road, but did not see a car traveling near him. The bicyclist hit the car causing him to be thrown from his bicycle. The bicyclist sustained serious injuries and was taken to the hospital. The driver of the vehicle did not sustain any injury. Our thoughts and prayers go out to the bicyclist and his family. 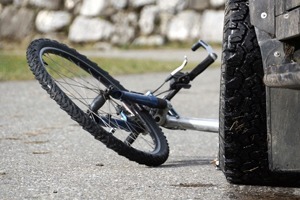 There are many factors that can cause a bicycle accident. There are also many preventative measures bicyclists can take to decrease the likelihood of an accident occurring. Look Before Turning or Crossing the Street: Make sure that you look both ways, before riding across the street. A motor vehicle can be driving at an increased rate of speed. Wear Reflective Clothing: Just because you see a vehicle does not always mean the driver of the vehicle sees you. To make yourself visible, wear neon, fluorescent, or other bright colors when riding day or night. Also wear something that reflects light, such as reflective tape or markings. Have Proper Bike Reflectors/Lights: Make sure that the front and back of your bike has reflectors and/or a bike light. Especially in the early morning hours and early evening hours, this is important for other motor vehicles to be able to see you from a distance. Obey all Traffic Laws: While on the road, be sure to abide by all traffic signs, signals and lane markings. Ride with Traffic: Always ride your bike with traffic, not against traffic. If you or a loved one is injured in a bicycle accident that was not your fault, call Freeburn Hamilton for help at 717-777-7777. When you call, one of our Experienced Pennsylvania Bicycle Accident Attorneys will speak with you absolutely FREE. Let Freeburn Fight for you after a serious bike accident. Our experienced Pennsylvania Serious Injury Lawyers can represent you in your serious injury claim. Just call the 7’s for help. There is no attorney’s fee due up front, and we only get paid after you do.